Oregon’s own one-day Haute Route. From a snowcat or lift ride to 8500′, we circle the mountain between 7500′ and 9600′ crossing several glaciers and ridges. This is full-on ski mountaineering using ropes, crampons, and ice axes to navigate challenging terrain. The ski circumnavigation of Mount Hood is a long day of skiing and alpine climbing. We start at the Timberline Lodge and circumnavigate the mountain in a counter-clockwise direction, climbing up and over several ridges and skiing steep slopes on every aspect of the mountain. We navigate glaciers, alpine ice, bands of rock, and of course corn skiing! You must have significant ski mountaineering experience to join this program. 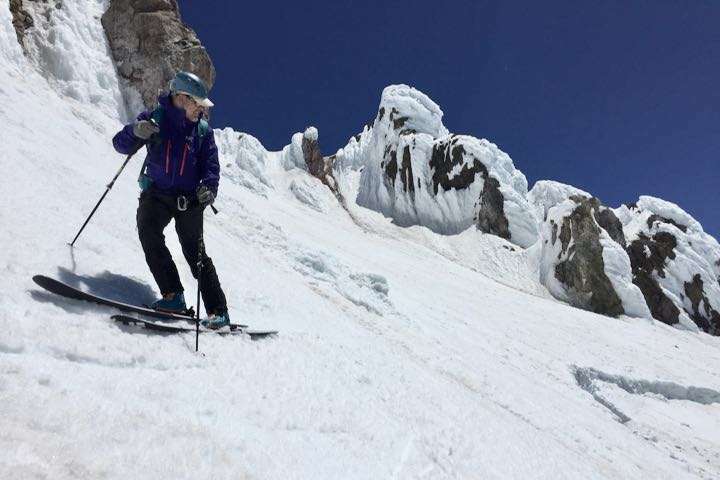 Ski descents throughout the Cascades are waiting: Broken Top, Mount Baker, and South Sister all have a range of skiing from moderate to expert.